Figured we can move on from the tack. Alison's stepped up to the plate. Come on Jo, bring it! Where's the birthing vest? or mat? Fran and I organised a swap (Fran, SPOILER ahead, if you'd like a surprise, don't read this post, yeah right, that's like saying "don't look", well I tried). I saw her button rings and jumped! Fran was an UBER swapper. She went above and beyond swapping generosity. 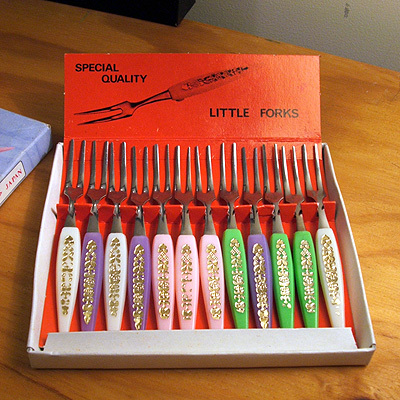 There were several rings, a book, more buttons for me to play with AND these lovely forks. Sorry these "Special Quality" forks. You think they have magic power? I reckon they do. Gotta love that packaging, the colours, the type, classic. They remind me of prawn cocktails when I was a kid. So what's Fran getting? She has a Blythe or 3? I think it's 3, Fran was being tight lipped about the number. More Blythe frock sewing was in order. Gotta get me one of these one day. I have no idea if they will fit, they are sewn from a Blythe pattern so it should be all good. Pattern from Puchimadam, click on the patterns link, under "library". 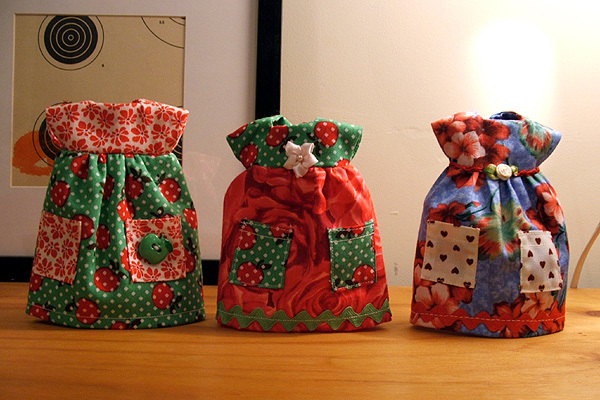 It's sooo much fun making mini frocks. Could you imagine these human sized? That apple button would be huge! The patterns would look fabu in human size. The dresses are about 110mm high approx. 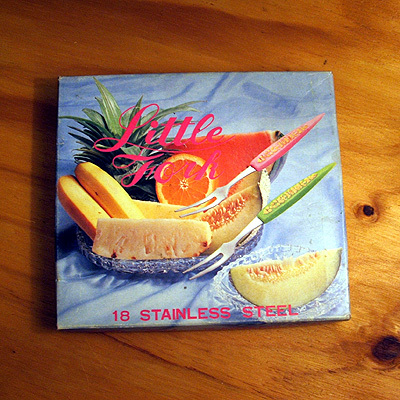 Individual, larger images over at flickr. I had a blast packaging these frocks. 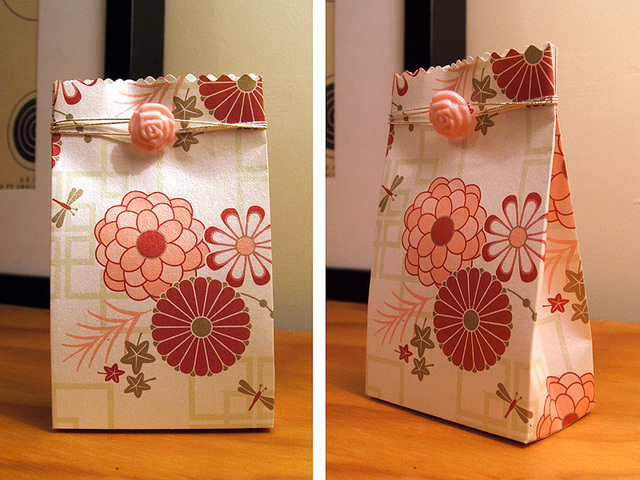 I used the template from Martha's money bags, deleted the pattern supplied in the pdf and overprinted the template onto printed paper. 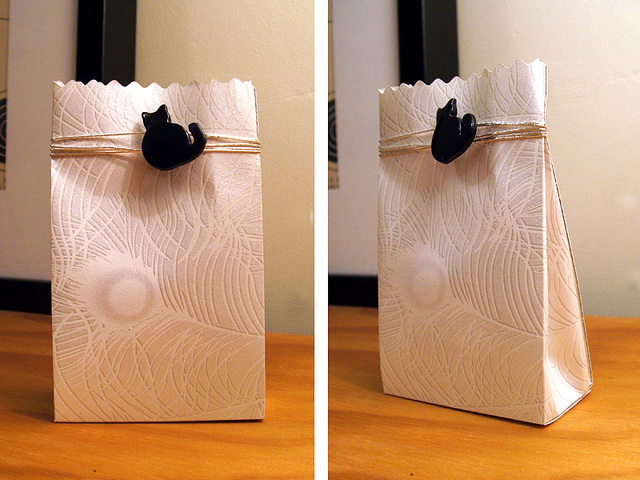 The tops of the bags were pinking sheared and I wrapped fine silver thread around the tops and added a button to each. 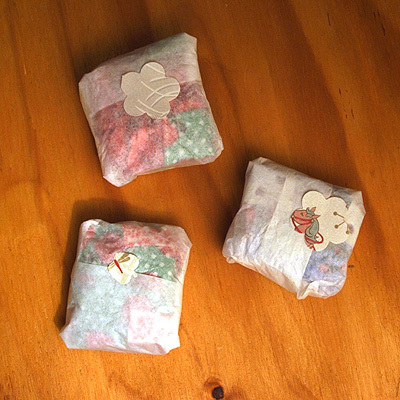 Each frock was wrapped in tissue and has a coordinating sticker to seal it. On a side note, I've started a flickr group for Jess Hutch fans. Join up and post your finished knits. Song of the week. Well it's an oldie to me, but it might be new to you guys. For you knitters, Camille's "Ta douleur" video and via Kate a freakin' excellent remix of the same song over at DJ Moule, click on Bootleg and download "Ta Douleur in a Field", be quick, it won't be up for long. There's a bunch of other cool stuff to listen to as well. What, you're still here! Go on, off with you! Nice forks, by the way. Suddenly I was swept back in time, about 30 years or so. We had forks like yours when I was a kid. Wonder where they did go..? Oh, love your blog by the way! Love the forks!! It's a blast from the past for me - the hawkers at the local wet market used to serve their chinese snacks with these forks, and everytime I was there with my grams, I would always want to bring one home with me (but never did, of course!). And those blythe dresses are stunning! Love the coordination with the fabrics! You guys have just set the bar way to high. But I'll get there. It will be worth the wait. Lovely little dresses and beautiful packaging. Those little dresses are gorgeous. A girl needs a coordinating capsule wardrobe. 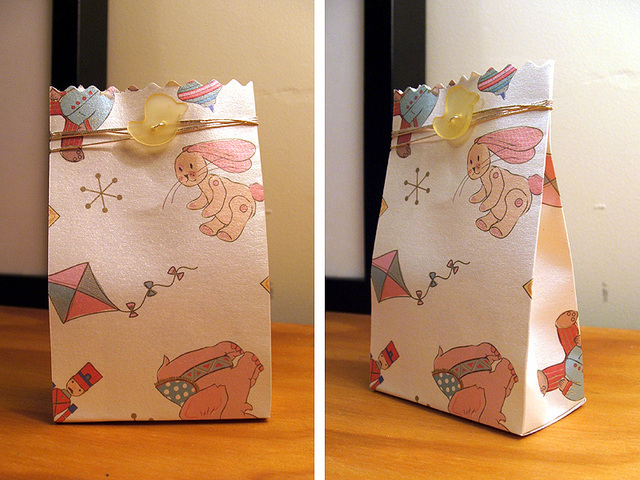 Super Super Super cute bags!!! Heh, those forks bring back memories... The frocks and packaging bags are fabulous! Good work. Arrrhhh. I can't breath! They are amazing...how could I not look? I'm so glad I did because now I can spend the next few days crazy with excitement - anticipating The Arrival...and I'm just talking about the packaging.